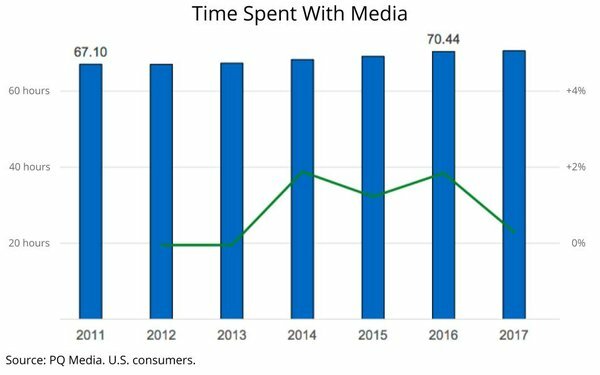 Even as consumer time spent with media continues to expand -- inching up 0.3% last year -- the percentage of time consumers spend with ad-supported media continues to decline, according to the 2018 edition of an annual report tracking and forecasting consumer media usage. “I can’t agree with him on the 30% [projection],” Leo Kivijarv, a partner at PQ Media -- who, along with founder Patrick Quinn, authored the new report. “I read and re-read Rishad’s comments,” Quinn said, adding: “I have a lot of respect for Rishad.” But PQ is sticking with its more moderate rate of ad-supported media erosion over the near term, because the analysts believe it’s not a wholesale abandonment of advertising, but more of a shift to new forms, such as brand integrations and content marketing that may not fit into classic categorization. The bigger question, says Quinn, is the overall “deceleration” in the rapid expansion of consumer time spent with media that happened with the Internet, mobile and other forms of digital media. “What’s the next new thing?” he ponders, adding that PQ is closely tracking the emergence of new platforms such as IoT, bots, AI and so-called “proximity marketing” and “smart technology” that could make brand marketing less blatant and more integrated into media experiences. “Things like McCormick & Co., which is working with MIT to figure out how to recommend its spices to consumers when someone opens their smart refrigerator,” Quinn explains. Meanwhile, ad-supported media continues to dominate share of consumer time on a global basis, largely thanks to the role that traditional media continue to play in developing markets worldwide. According to PQ’s latest projections, ad-supported media currently represents two-thirds (66.5%) of the 7.3 hours consumers spend with media worldwide. PQ projects that ad-supported media’s share will fall to 63.4% by 2021. 4 comments about "Advertising Falls To Lowest Share Of Time Spent With Media Ever". 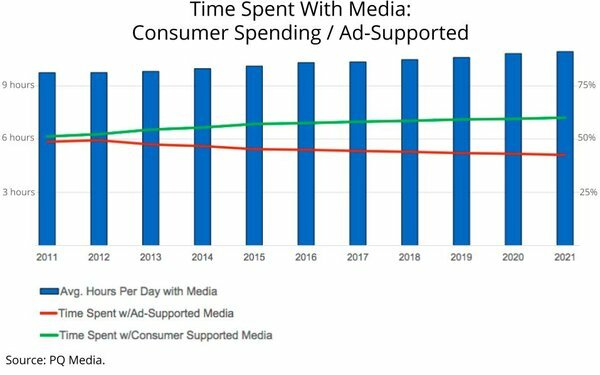 Ed Papazian from Media Dynamics Inc, March 1, 2018 at 12:35 p.m.
Joe,judging by the hours-per-day aspect of the chart it seems to count only TV, radio and print media as "ad-supported" while the rest, which I assume is mainly digital media is classified as not ad-supported. But, from an advertising standpoint aren't there a lot of ads of various types on digital platforms? So, if the main point is that "linear TV", broadcast radio and printed editions of magazines and newspapers are slowly declining in collective share relative to other forms of media---mainly digital---that's not exactly breaking news. The main point I got from Rishad's conjecturing was that advertisers may soon be running out of places and venues where they can advertise---hence the 30% possible decline that he cited in advertising availablilties. Sorry, but I don't get this. If digital media is growing in terms of uage---as is the case--and digital media is, for the most part, a large collection of ad vehicles, the only way that advertisers could lose 30% of their total advertising exposure opportunities would be if "linear TV" and broadcast radio were to lose a majority of their audience tonnage--or time spent. Then, and only then, you might see the 30% reduction in total advertising exposure availabilities that was speculated upon by Rishad. Frankly, the trend lines so far don't come close to supporting that assumption for "linear TV" or for broadcast radio. Some attrition, sure---- that is to be expected with more media options competing for our time. But an almost total collapse----I don't see how one can predict that based on what has happened so far. Joe Mandese from MediaPost, March 1, 2018 at 1:05 p.m.
@Ed: I just tried pasting PQ Media's boilerplate delineating the media it tracks, but it is eight pages of fine print and MediaPost's comments field apparently has a character limit. I will forward you that in a separate email. I believe the main distinction PQ uses to bucket which media going into ad-supported vs. consumer-supported media is which is the "primary" source of revenues for that medium. Re. Rishad's projection, I cannot speak for him, but I don't think it was based on a decline in advertising availabilities. I think it was based on a decline in the share in the amount of time consumers spend actually being exposed to those availabilities. It's an aggressive projection, for sure, but we'll find out in the next five years. I think Rishad believes we are reaching an inflection point vis a vis consumer tolerance of all those advertising availabilities and that they are finding alternatives becuase they don't believe it's worth their time. Ed Papazian from Media Dynamics Inc, March 1, 2018 at 4:44 p.m.
Joe, the way I see it, Rishad was probably speculating on a very sharp decline in "linear TV" viewing by the average adult as he certainly wasn't thinking that this would happen to digital media---which also conveys ads to consumers. As you know, we have projected time spent estimates by various demographic segments for many years in our reports, "TV Dimensions" and Intermedia Dimensions". ---in the latter case for all media. Looking at the trend data, which shows a modest decline for both "linear TV" and radio for all adults and, as we know, a greater one for light viewing 18-34s, I can find no basis for the huge fall off in "linear TV" usage that would be required to diminish the amount of total ad carrying media usage that Rashid says might happen. We often equate total TV viewing with broadcast network primetime entertainment shows, however these constitute a small minority of the TV content that most adults consume. For TV to lose most of its viewing time, people would have to give up on the AM news/talk fare, most daytime shows, most news shows, the late night stuff, reality shows, virtually all sports viewiing plus lots of other kinds of content as well as primetime network dramas and sitcoms. Unless we believe that SVOD/OTT is going to take over all of these genres---no sign of that happening----why would viewers divert so much viewing time to SVOD/OTT? The primetime entertainment shows get most of the buzz but we need and get a lot more than that from TV. Joe Mandese from MediaPost, March 1, 2018 at 4:47 p.m.
@Ed: I'm not sure, but in covering Rishad and in some follow ups, that never came up. I don't think he was pinning it explicitly to linear TV, but in consumers either choosing to use non-ad-supported media options or using technology to advoid advertising in ad-supported ones, like ad-blockers which impact browser-based media. I'll see if I can follow up and get a more explicit sense from him about which media will be impacted specifically.